Following on from the incredibly popular title Thunderstruck, Thunderstruck II features all the same additions we saw in the original with improvements, including the move to a five-reel, 243 Ways to Win pokie with a bigger non-progressive jackpot. 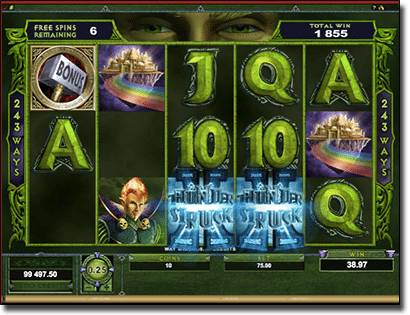 Since it was released in 2010 by Microgaming, just over a year after the first 243 Ways to Win pokies were released, it was quite a unique title to play. As more and more 243 Ways to Win pokies were released, Thunderstruck II remained as a favourite. There’s a maximum of 300 coins available per spin here, with coin sizes ranging between 0.01 and 0.25. The minimum bet is $0.30, while the maximum bet per spin is $75 offering a wide range for players interested in the game. Based on four Nordic Gods including Valkyrie, Loki, Odin and Thor, we’re treated to animated cartoon-like graphics – disappointing for those of you who were expecting the face of Chris Hemsworth (plays Thor in the movie franchise by Marvel). The music accompanying the title is very fantasy-based and the build up can add to the suspense – however it can get frustrating too so if you wish to mute it you can do so by clicking the speaker icon in the top right hand of the game screen, or by clicking ‘options’ in the bottom left hand of the screen. Here, you can also opt for QuickSpin, and whether you would prefer bet and win values to be displayed as credits or coins. Thunderstruck II is considered to be a medium variance pokie with an RTP of 96.6%. Additionally, the non-progressive jackpot is set at a nice 2,500,000 coins. Microgaming have used the 9 to A symbols to represent the lower value symbols, with five A symbols offering the largest payout out of them all at 150 coins. The middle value symbols are represented by ship, the castle, and the Nordic Goddess, Valkyrie. She pays the highest out of these symbols at 300 coins for spinning five. The higher value symbols are represented by the three other Nordic Gods, with Thor paying the highest at 500 coins by spinning five. Bonus symbol: The Bonus symbol is Thor’s hammer featuring the text ‘Bonus’. Spin five to receive the symbols maximum payout of 200 coins, and spin at least three to trigger the Great Hall of Spins. Wild symbol: The Wild symbol is the Thunderstruck II game logo and pays a maximum of 1000 coins by spinning five. It also substitutes for all symbols except the Bonus symbol and a 2x multiplier is applied when it completes a winning combination. Thunderstruck II offers an array of special bonuses, but the best is the multi-level bonus, known as The Great Hall of Spins. You need to spin at least three Scatters to enter the first level of the multi-level bonus, known as the the Valkyrie Bonus Game. Here you are awarded with 10 free spins and a 5x multiplier. To get to the next levels you need to spin at least three Scatters a certain number of times. The Loki Bonus Game requires at least three Scatters to be spun a minimum of five times before being unlocked. Once you have, you are awarded with 15 free spins, as well as a Wild Magic symbol randomly appearing and transforming up to 14 symbols Wild. The Odin Bonus Game requires at least three Scatters to be spun a minimum of 10 times before being unlocked. When you do, you will be awarded with 20 free spins plus extra Wilds and a 6x multiplier. Finally, the Thor Bonus Game requires at least three Scatter symbols to be spun a minimum of 15 times before being unlocked. Once triggered you will be awarded with 25 free spins with Rolling Reels and a 2x multiplier which will increase up to a 5x multiplier on consecutive wins. There’s also the Wildstorm Feature randomly activated in the base game. Here, five reels turn Wild for big wins. With a theme so incredibly common, the features have to stand out from the rest – and Thunderstruck II features do just that. The multi-level bonus is exciting and attempting to unlock it keeps you on your toes, while the base game wins aren’t too shabby while you spin more to activate each level. It can take some time to unlock the bonus games, but since the first bonus level is quite generous with the 5x multiplier for each free spin, this isn’t too much of a drawback. 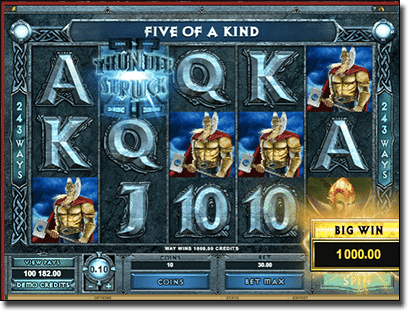 You can find Thunderstruck II at the majority of our recommended online casinos – we played it at RoyalVegasCasino.com for the premier Microgaming experience. Are pokies and slots the same thing? Why are pokies popular in Australia? 2010 - 2017 PokiesSite.com. All rights reserved 18+ Gamble responsibly.